Microsoft today outlined more details regarding the improvements coming to SkyDrive in Windows 8.1, including placeholder files, offline access, and file picker integration. In the first week after Build 2013, when the preview of the latest Windows update was released, the company says it saw over 3TB of data uploaded to SkyDrive per day from Windows 8.1 users. Microsoft also explained a little about why it is pushing so hard in the cloud-storage space by citing industry trends: while devices have increasingly larger storage capacities (growing at about 25 percent per year), people’s data and files are growing significantly faster (around 50 percent per year). We’ve heard of some of these SkyDrive improvements already when Windows 8.1 first showed up, but now the company is offering a bit more information on what to expect. The first improvement in Windows 8.1 is placeholder files, Microsoft’s attempt to provide users access to all their SkyDrive files without actually downloading them, in an effort to minimize local disk space and Internet bandwidth (especially on mobile devices). These placeholders look and feel like normal folders and files: you can tap or click a folder and see all the folders and files inside it, tap or click a file to open it and edit the contents, as well as move, delete, copy, or rename them. The difference is in the backend: Microsoft only downloads the full file when you access it. The placeholder meanwhile contains just a thumbnail image along with some basic properties and file contents. This lets the placeholder file be significantly smaller in size that the file in SkyDrive. Speaking of photos, Microsoft downloads and pre-fetches large thumbnail images instead of the actual files when you’re just viewing pictures. Only when you want to edit a photo does SkyDrive actually download the full file to the local disk. The early results are impressive. Since Windows 8.1 Preview was released, this new architecture means SkyDrive files are taking up less than 5 percent of the local disk space that they would have taken in the old system. On the opposite end to placeholder files is support for offline access. Whether you want the documents you’re working on to be there when you lose Internet connectivity or you want all your edits to make their way back up to SkyDrive when you connect again, Windows 8.1 should take care of everything without any manual configuration nor setup. Yet the best part is that SkyDrive will automatically mark files for offline access if you’ve opened or edited them on a given device before. Microsoft says most people tend to open the same files they recently opened, but these vary across different devices – so the company remembers files unique to the device you’re using. 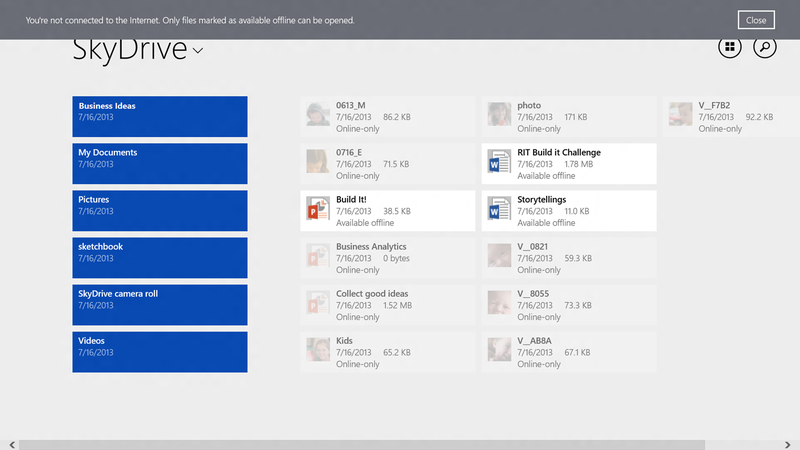 If you’re working on a device with a lot of local storage, you can naturally choose to have your entire SkyDrive available for offline access. Last but not least, we have the Windows file picker, which any Windows Store app can use to let users open, edit, and save files. 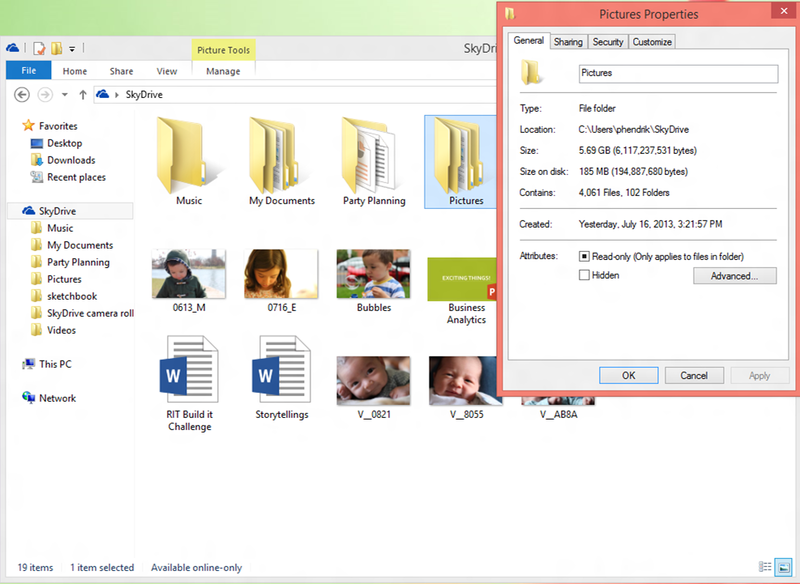 In Windows 8.1, SkyDrive is built into the file picker so every app can save files directly to the cloud without any extra work (files are uploaded in the background). This also extends to the desktop File Explorer for all Windows 8.1 users (as long as you’re signed in to Windows with a Microsoft account): you can drag folders and files from any device to SkyDrive and uploads will automatically pause and resume on disconnection and reconnection. Finally, SkyDrive files show up in search results just like local files (Microsoft extracts a few lines of text from the document and provides that to the search indexer). 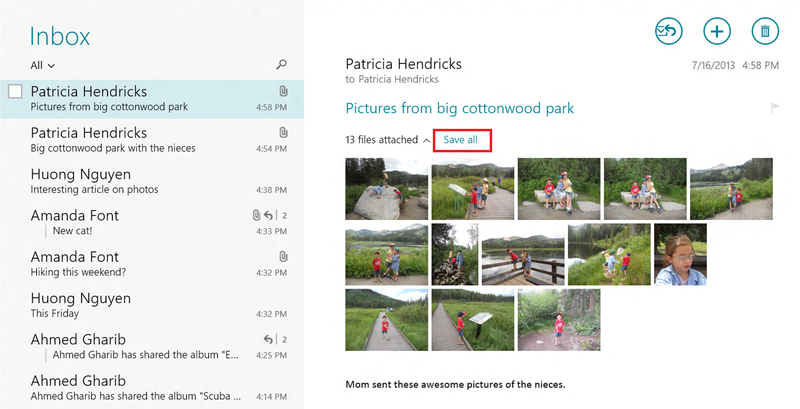 Even with all the above, the SkyDrive improvements are far from over. “We’ve also gotten feedback on what else you’d like to see in the product, and we’re working hard to address that feedback in the upcoming milestones,” Mona Akmal, Group Program Manager for SkyDrive apps, said in a statement. We’ll keep you posted as we learn more and Windows 8.1 is released next month.